Hey Wyrdos! It's another Friday so it's time for another preview! It's time to turn the heat up with a look at the Gorysche, the titan for the Cult of the Burning man. Around 1,000 AD, a large portal between worlds opened in the Sorochinsk Mountains in Russia. Through that opening came Goryshche, a mutated creature that inspired countless legends of dragons and hydras. Goryshche used her intelligence and cunning to lure people up to her mountain lair, where she kept them captive until she consumed them. Over time, the local population saw the danger she possessed and attacked the fearsome monster. At the time, Goryshche was not a creature of flame. She was a creature capable of incredible regeneration with a distinct weakness to fire. Taking advantage of this weakness, she was slain and her regenerative powers halted. Almost a thousand years later, the pieces of Goryshche's destroyed body were found by Russian cultists of the Burning Man. Through arcane rituals and massive power, the cultists were not only able to bring Goryshche back to life, but they were also able to infuse her body with the Burning Man's fire, undermining her biggest weakness. The cultists didn't stop there, though. 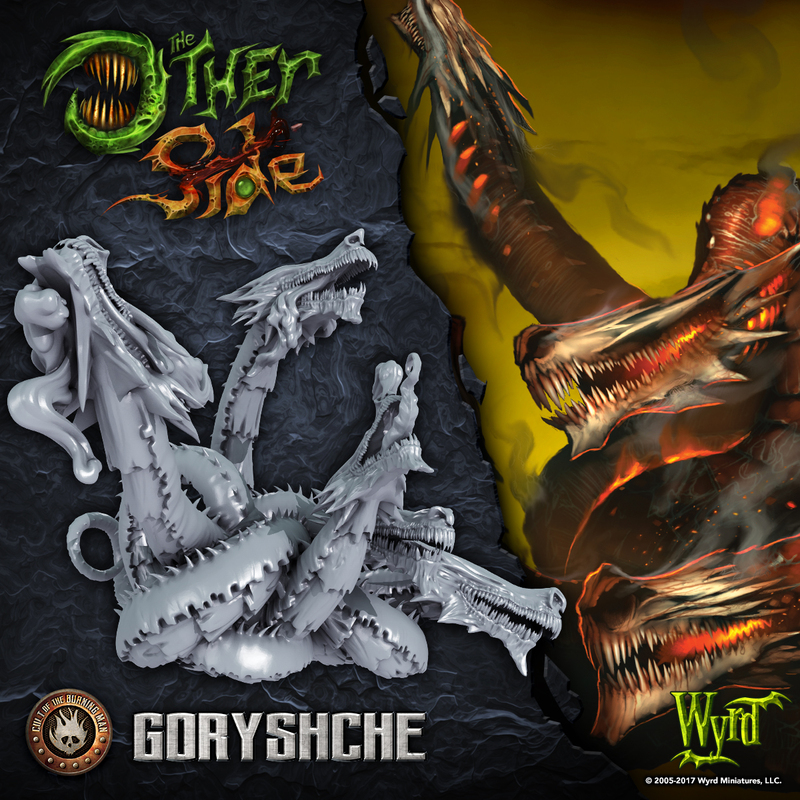 Goryshche had been dismembered by her murderers, and the Cult resurrected her again and again from multiple pieces of her corpse until they had many of the creatures, all collectively known as Goryshche, on their side. On the table, a Goryshche has low Armor but is capable of repeatedly Attaching Assets to herself, making her quite survivable. Where Goryshche really shines, however, is in melee. The Hungry Maw Action is quite potent, and when combined with a multitude of Snapping Head Assets, a Goryshche quickly becomes an unstoppable killing machine. Getting the most out of one of these Titans usually involves clever Asset management and hitting the opponent from an unexpected direction, as they cannot sustain any sort of sustained, focused assault. Every time I hear more about the cult, the more awesome they sound! Looking forward to this beastie! By far the best Titan! Fantastic, been looking forward to this one I really like the idea that they're all technically revived from pieces of the same creature, reminds me a bit of apple tree grafting lol. Sorry, Alpha crawler, we missed your forum. The background is clearly. It explains why Goryshche is the cheapest Titan. But I am so surprised about the Russians.